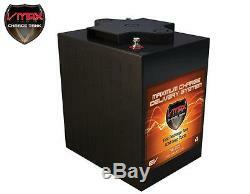 V6-225 VMAX 6Volts 225AH Deep Cycle High Performance AGM Battery for SOLAR PANEL. V6-225 Superior Plates with an expected life of 10 to 12 years in float service applications. 9.5"w x 7.3"d x 11h. AC Chargers: Any Quality Brand AGM- Smart & Microprocessor controlled- charger with the recommended specs above can be used. Solar Panel: 175W-450W (120W may be used if Depth of Discharge would not exceed 50%). Warning: Do not use a charger with smaller amperage than the recommended Charging Current shown above. &###xA0;&###xA0;&###xA0;&###xA0;&###xA0;&###xA0;&###xA0;&###xA0;&###xA0;&###xA0;&###xA0;&###xA0;&###xA0;&###xA0;&###xA0;&###xA0;&###xA0; Maintainers should ONLY be used to maintain a fully charged battery but NEVER as a charger. Charge:&###xA0;&###xA0;&###xA0;&###xA0; 14140F. Cycle use:&###xA0;&###xA0;&###xA0;&###xA0; -15mV/C. BCI Group Codes: &###xA0; &###xA0; &###xA0;&###xA0; Matching Termination:&###xA0; GC2 &###xA0;&###xA0;&###xA0;&###xA0;&###xA0;&###xA0; Matching is based on closest dimensional specifications. Differences in hold downs and termination may require some accommodations and/or the extension of one or both vehicle's battery cables. Any product you return must be in the same condition you received it and in the original packaging. --Solar Panel: 175W-450W (120W may be used if Depth of Discharge would not exceed 50%). --Wind Turbine: 175W-450W Warning: Do not use a charger with smaller amperage than the recommended Charging Current shown above. Maintainers should ONLY be used to maintain a fully charged battery but NEVER as a charger. Operating Temperature Range: ---Discharge: -4140F ---Charge: 14140F ---Storage: -4140F Temperature Compensation: ---Cycle use: -15mV/C ---Standby use: -10mV/C UPC: 804879288206 BCI Group Codes: Matching Termination: GC2 Matching is based on closest dimensional specifications. The item "VMAX V6-225 6Volts 225AH Deep Cycle High Performance AGM Battery for SOLAR PANEL" is in sale since Wednesday, August 23, 2017. This item is in the category "Home & Garden\Home Improvement\Electrical & Solar\Alternative & Solar Energy\Other Alt. The seller is "hurricanewindpowercom" and is located in Roanoke, Virginia. This item can be shipped to United States, Canada, United Kingdom, Denmark, Romania, Slovakia, Bulgaria, Czech republic, Finland, Hungary, Latvia, Lithuania, Malta, Estonia, Australia, Greece, Portugal, Cyprus, Slovenia, Japan, China, Sweden, South Korea, Indonesia, Taiwan, South africa, Thailand, Belgium, France, Hong Kong, Ireland, Netherlands, Poland, Spain, Italy, Germany, Austria, Israel, Mexico, New Zealand, Philippines, Singapore, Switzerland, Norway, Saudi arabia, Ukraine, United arab emirates, Qatar, Kuwait, Bahrain, Croatia, Malaysia, Brazil, Chile, Colombia, Costa rica, Panama, Trinidad and tobago, Guatemala, Honduras, Jamaica, Bahamas, Viet nam.